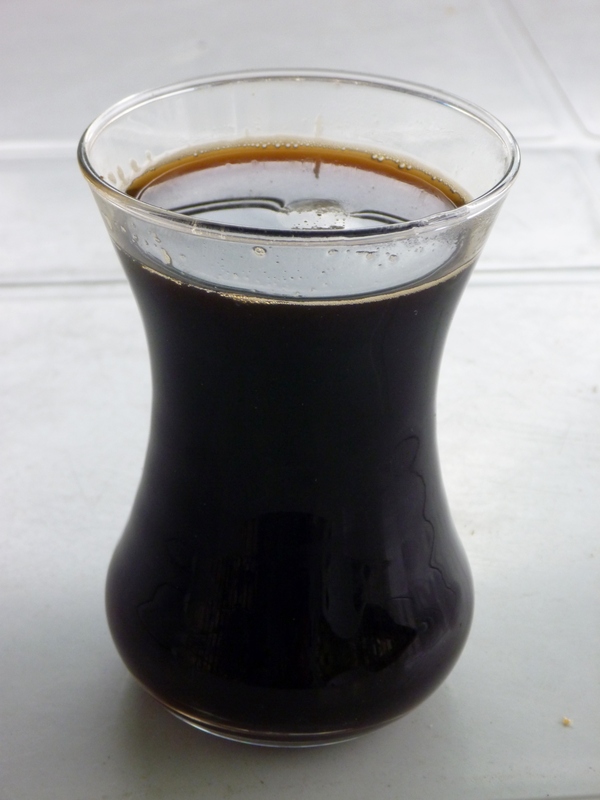 I had my first real Turkish coffee in Sivas. Next morning I woke up far too early for some inexplicable reason. So it was straight to the beer garden for breakfast with a view. I took my time over a lazy breakfast which included my first real Turkish coffee. I was surprised to find that the most common drink for Turkish people wasn’t coffee at all but chai – green tea invariably sweetened with two sugar cubes. Like just about every other country I had visited so far. With only 350km to Kirikkale I was in no hurry to leave so I chatted to Orhan, my Red Bull-fuelled friend from yesterday, as I packed the bike. He begged me for a ride of my bike. As a general rule I don’t let anybody ride my bike and certainly not an adolescent male who seemed to have a can of Red Bull permanently grafted to his hand. As grateful as I was for his help in finding another hotel yesterday, there was no way I was going to let Orhan ride my bike. I could just see him trying to do a X-Fighters FMX stunt on my bike, which weighed over 300kg when fully loaded, in the main street of Sivas and only managing to smear it and himself along the bitumen. I had thoroughly enjoyed my brief overnight stop in Sivas, but it was now time to move on. I had a self-imposed schedule to be in Istanbul in 2-3 days. I waved goodbye to Orhan, still standing disappointedly on the footpath. 9°C! As if! But it was a nice balmy 29°C! The road to Kirikkale was perfect but not of any great interest. 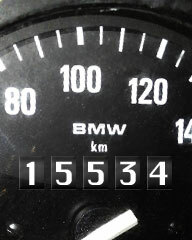 I stopped every 100km or so to break up the monotony. 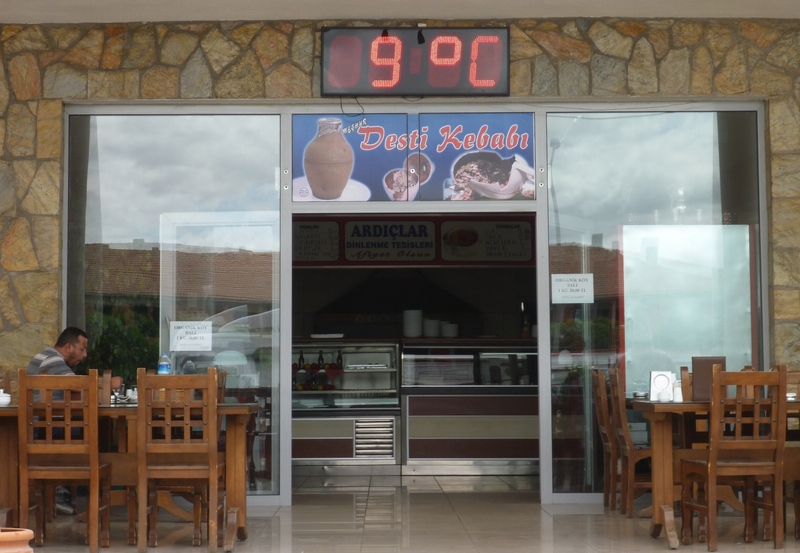 Just after noon I pulled into a roadside café which had a digital thermometer telling me it was 9°C. Based on how much I was sweating inside my helmet and jacket, I was pretty sure it was hotter than 9°C. It turned out to be 29°C of course, as the “2” kept flickering on and off. Still, it was first time in months that the midday temperature had been less than 30°C. A sign that the long, hot summer was finally coming to an end? I could only hope! Just before reaching Kirikkale I saw what was to be the first of many mosques built in the characteristic Turkish design – all looking like miniature versions of the famous Sultanahmet Mosque in Istanbul. By early afternoon I was in Kirikkale. I had given up on any plan to ride on to Ankara. Ankara has a population of 5 million but the urban sprawl goes on forever in all directions. After Delhi, Lahore and Tehran I had had enough of big cities. I just couldn’t find a compelling reason to get drawn into that morass of motorways. 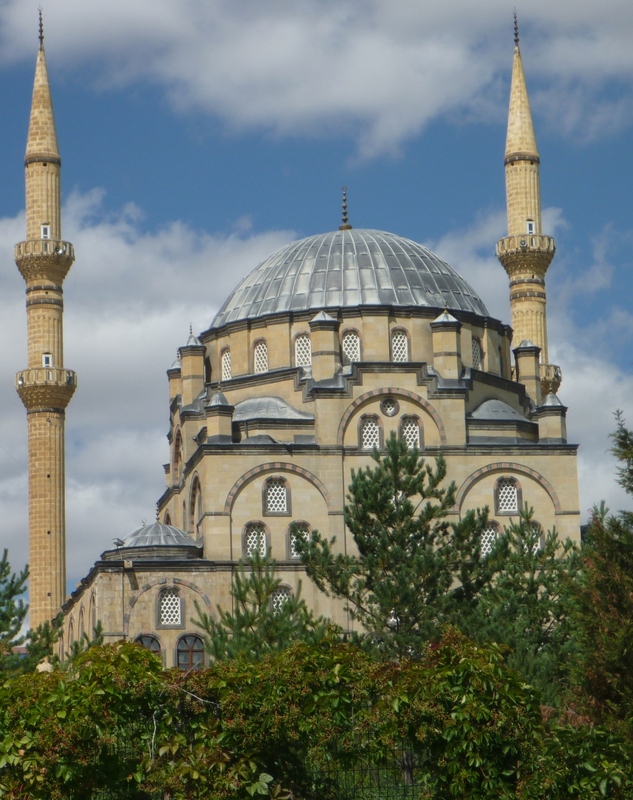 My eyes were now firmly fixed on a much greater prize – Istanbul. After my unexpectedly pleasant little sojourn in Sivas, I thought I would try to repeat the dose in Kirikkale. The plan was simple and had worked many, many times before. Step 3: Ask friendly shopkeeper for name and (hopefully) directions to cheap hotel. Step 4: Attempt to follow directions given in “Turklish”. Step 5: Get lost several times trying to follow directions. 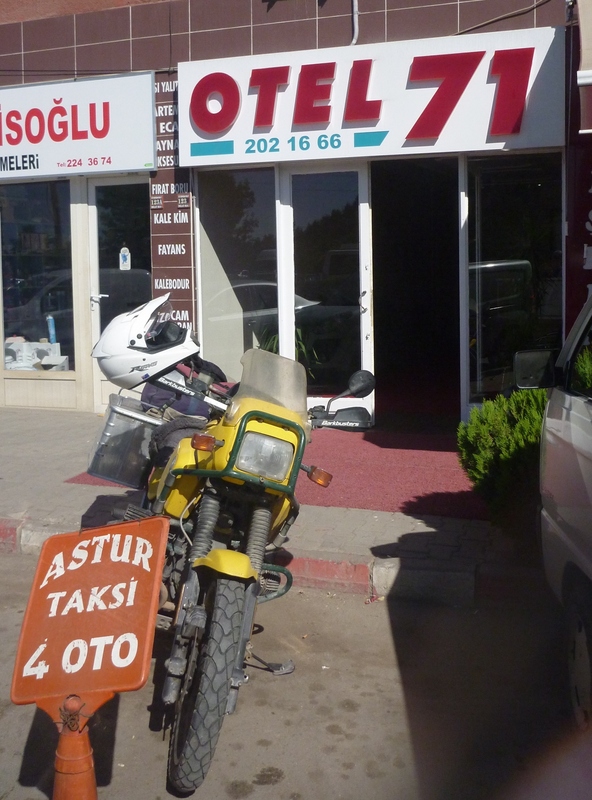 Otel 71 – nice little place, shame about the staff though! Usually, with a bit of luck, after the second or third iteration I had found a suitable hotel. It was all part of the fun of travelling in foreign countries and a chance to meet the locals. Not only couldn’t I find a suitably cheap hotel, I was having trouble even finding a friendly shopkeeper. After about the fourth or fifth attempt I eventually bumped into a man in the street who just happened to run the petrol station (I wanted to get petrol as well). He recommended the Otel 71 which was only about 1km away. It seemed a little odd that none of the local shopkeepers knew that there was a hotel so close. I found the Otel 71 fairly easily and it looked like a reasonable place to stay. But I was curious why it was called Otel 71 because its street number was 24. In retrospect, I think it was because it was 71st on a list of the top 71 hotels in Kirikkale. Not that there was anything wrong with the hotel itself. 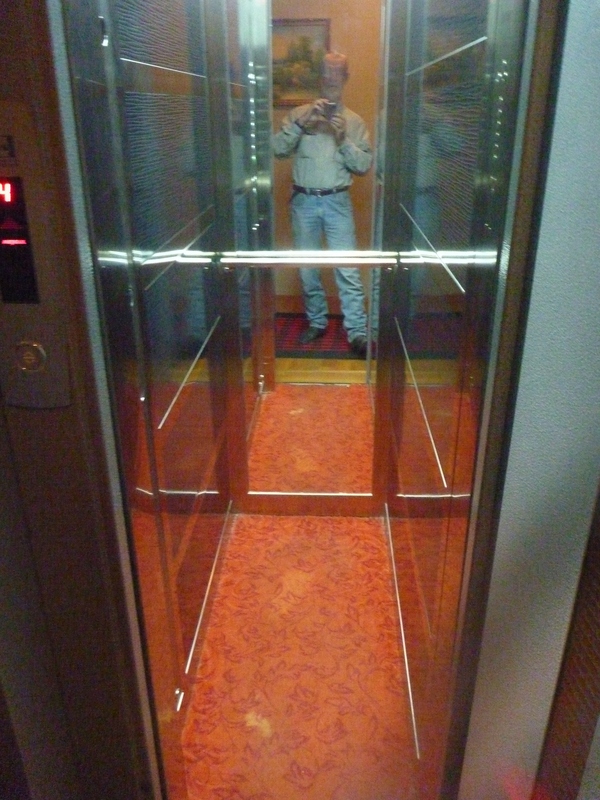 Apart from the microscopic lift which was barely big enough to carry one person and their luggage. I have seen deadman’s lifts bigger than this! No, the Otel 71 was let down by some of the rudest and most disinterested staff I had met in my entire travels. The smallest request (like, say, a light bulb that worked) was a major interruption to more pressing tasks such as their “Call of Duty: Black Ops” computer game. After about 40min, the manager turned up with the keys to the cupboard where the spare bulbs were kept locked away. Didn’t he trust his own staff? After replacing the bulb, the manager asked me the usual questions: where was I from, where was I going, where had I been. Then he asked me a question that completely stumped me. “Why are you staying in Kirikkale? Nobody stops in Kirikkale”, he asserted. “Why indeed?”, I mused to myself. I couldn’t think of any reason. And the manager certainly wasn’t doing a great job as an ambassador for Kirikkale. With that sort of welcome there was no incentive to stay longer than necessary. Tomorrow I would head for Istanbul. Still following your travels Brian.